Travelers often ask us for recommendations for the best family-friendly holiday in Asia. We’re firm believers that Asia is great for family trips, but we know it’s difficult figuring out what the best destinations are in this vast region for your specific family needs. To help you plan the most amazing family trip in Asia, we’ve compiled a list of places we think you should consider. As travel experts – and parents – we’ve drawn on our own experience to decide the best places based on ease of access, things to do, climate and general baby-friendliness. Whether you’re a family of outdoorsy types, a beach-loving brood or a bunch of culture buffs, the following destinations in Asia for families will keep you and your junior travelers happy from start to finish. So grab your Trunki and away we go! Towering skyscrapers, theme parks, a sparkling harbor, fine dining, shopping, Michelin-star-rated street food – Hong Kong’s got it all. The public transport system is extensive and easy to navigate, there are fun city walks that immerse you in colorful street culture and there’s even hiking if you have older kids. Importantly, if you have younger children, are the theme parks. Hong Kong is home to Disneyland, probably first on your kids’ list, followed by Ocean Park, which is usually not as crowded as Disneyland. For something both adults and children will enjoy, there’s The Peak, with a scenic circle walk and tram ride up and down (or you can walk, if you want to burn up all that youthful energy). Ngong Ping – the Big Buddha – on Lantau Island is a also fun day out – especially the part where you ride in glass-bottomed cable cars. After all that, wear them out with a walk along the avenue of stars as you’re watching the light symphony on the harbor. This tour pairs China and Hong Kong together in a family-friendly trip that gets kids engaged at every step. Starting in Beijing and including some ‘bucket-list’ activities even for adults, the trip ends in Hong Kong with one day at Ocean Park and a day of cruising around the city, with a must-experience ride on the Star Ferry across Victoria Harbor. The Land of Smiles is one of endless fun and adventure for travelers of all ages. The entire country is suitable for families, whether you want mountains and jungles in Chiang Mai, beaches and islands in the south or action and adventure in Bangkok. If it’s culture and nature your family enjoys, then Chiang Mai is hard to beat. It’s got temples, hill tribe villages, elephant sanctuaries and a more laidback vibe than its more southern counterparts. The beachy destinations of Phuket, Samui and Krabi are also great for kids. There are island-hopping tours, snorkeling trips, elephant camps and hiking trips in these destinations too, though with more of an emphasis on relaxation and downtime on the sand. Bangkok, meanwhile, has shopping, the Grand Palace, famous temples, floating markets, Chinatown, urban tours and lots more to keep all ages happy. Children are celebrated across Thailand – they’ll be happily received wherever you go. Smaller kids are especially fawned over, and it’s not uncommon for them to have their picture taken. For families with babies and toddlers, Bangkok is well-equipped with family and nursing rooms – just head to the nearest luxury mall and you’ll find a baby change room on every floor, with comfortable, well-equipped nursing rooms in every department store. When it comes to food on-the-go, there are convenience stores on every corner with a generous selection of drinks, sandwiches and snacks. If you’d like to travel Thailand with your family, there’s no reason to limit yourself to one city. A cross-country tour can show you all the kid-friendly highlights from Bangkok up to Chiang Mai, down Phuket and beyond, with elephants, islands, city tours, river cruises, jungle treks, eco-stays and hill tribe village visits all in one epic journey. We always refer to Laos as ‘laidback’ – and that’s one of the very qualities we think make it great for families. Life with children is already hectic, and a holiday should give you a chance to escape some of the rush of the everyday. Enter: Luang Prabang. This picturesque UNESCO World Heritage Site moves at a relaxed pace. It’s a destination where you can slow down and enjoy the sites. Get up early and see monks do their morning alms. Take your time visiting temples. Cruise along the Mekong, exploring hidden caves and ancient shrines. Trek the jungles. Visit an elephant camp. It’s a laidback town, but there’s plenty of intrigue, even for the smallest voyagers. Most of Luang Prabang’s appeal is timeless – there’s no age limit to enjoying a dip under a waterfall or visiting an bear rescue. A trip to Luang Prabang is best suited to families with older children who’ll enjoy things like exploring forest trails, experiencing farm life, sailing along the river and staying in jungle lodges. Though this isn’t a kids’ club type of destinations, higher-end hotels have pools and babysitting services cribs. A Luang Prabang trip with action and adventure is perfect for the travelling family. After getting up early to see the alms rounds, kids can see firsthand how buffalos contribute to local farming, swim in a waterfall, meet some rescue bears, cruise along the Mekong to a shrine in the Pak Ou Caves, stay in a jungle lodge and even pan for gold. Vietnam is a big country, with plenty of diverse experiences on offer to cater for traveling families. There are city destinations such as Hoi An ad Hue, packed with culture and history and beautiful scenery. There are family beach holidays in Nha Trang or Phu Quoc. There are adventures that await in stunning national parks, such as Cat Tien, with its lush rainforests and night safaris. And naturally, there’s Hanoi and Saigon, if a city trip is more your style, with plenty of options for kid-friendly dining, market shopping, water parks, museums and colorfully fun places made specifically for kids’ entertainment. Alternatively, if it’s a more indepth culture experiences you’d like for your family, you might even consider a journey through the Mekong Delta or a trip to the northernmost parts of Vietnam, such as Sapa, to show the kids what local life is like. Traveling in Vietnam with kids is fun – there are numerous activities for them to get involved in that are both culturally immersive and just for kicks, it’s simply a matter of narrowing down which ones suit your brood. Traveling with a baby is also doable. A baby carrier is essential (sidewalks are not built for strollers) and you’ll have to take regular breaks to manage the heat, but in the major cities there are lots of air-conditioned spaces to cool off in and abundant taxis for quick trips back to your hotel. Formula and diapers are widely available and, like Thailand, the Vietnamese just adore babies. If you want a trip your children will remember forever – one that will really broaden their horizons – consider a family Mekong Delta trip. Cruising along the Mekong, you’ll stop off to explore villages, visit temples, meet with local farmers and even experience local life with a homestay in a river town. Cycling through rice fields, visiting floating markets and sleeping on a riverboat are all part of this exciting adventure. Borneo is about as ‘exotic’ a destination as you can get. Jungles, rivers, corals reefs, mountains and – who could forget – orangutans. Even though this far-flung island is covered in ancient rainforest and surrounded by dense mangroves, it’s surprisingly accessible. Flying in to the main international airport at Kota Kinabalu takes six to seven hours from Bangkok and once the long hauls flights are (mercifully) behind you, you can enjoy great food, luxury accommodation and absolutely stunning natural scenery. We recommend a Malaysian trip in Borneo – it’s much easier than traveling the Indonesian with kids due to higher levels of English and better tourist infrastructure in general. You’ve got Mount Kinabalu if your family likes hiking, beautiful islands and beaches off the coastline for little swimmers and cities such as Sabah, Sarawak and Kuching to explore. And no trip to Borneo would be complete without a jungle tour – perhaps a river cruise through tangles forest, on which your junior explorers can spot monkeys, hornbills, wild orangutan and even pygmy elephants. A family trip to Borneo also presents a fantastic opportunity to instil children with a respect for animals, the environment and indigenous culture in a fun and exciting way. For an amazing Borneo trip your kids will be raving about for years to come, consider an active holiday that pairs wild expeditions in the jungle with urban explorations. A trip like this family-friendly Borneo holiday includes that all-important visit to an orangutan sanctuary, a wildlife-spotting river cruise to see proboscis monkeys and macaques in the wild and a city tour of Kuching. It’s only a short trip, so you could pair it with downtime on one of Borneo’s many idyllic islands. Myanmar, just like Vietnam and Thailand, is a great place for a family trip. In particular, Bagan, which plunges travelers young and old into majestic and magical Myanmar history. Not every kid can say they’ve taken a hot air balloon ride over ancient 2,000 temples, or even ridden on a horse-drawn cart between them, but a trip to Bagan lets them do just that, plus much more. The laidback nature of the ancient capital is perfect for families who like to explore at their own pace. There’s no peak-hour traffic to get stuck in or boring queues to wait in here. You can combine sightseeing with lazy afternoons back at the hotel, where the kids can play in the pool while you catch up on some reading. Around Bagan, you’ve got myriad temples to visit, plus museums, local craft workshops and villages specially set up to show tourists aspects of traditional daily life. The only thing that’s not recommended for families with smaller children is sunset-viewing from Shwesandaw Pagoda, as the stairs are steep and there are no railings. Hot air balloon rides is also restricted to children 8 and over, but a babysitter can normally be arranged through your hotel. If you’re interested in Bagan but also want to see more of Myanmar while you’re there, why not take the crew on a fun, across-Myanmar adventure? Spend some time in Yangon, where the kids can try their hand (or feet, rather) at the local ball sport, chin lone, and feed the famously huge fish at Maha Wizaya Temple. After your expeditions in Bagan, you can visit an elephant camp, take a trishaw trip around a quiet country town and explore Inle Lake’s overwater villages by wooden boat. A private guide helps you get the most out of every location and keeps transfers and activities running smoothly. Bali is just a classic destination, no matter how old – or young – you are. With well-developed infrastructure and a wealth of things to do, places to visit and foods to eat, it is perhaps the most family friendly island destination in Asia. Kids of all ages will find something to intrigue and excite them in Bali. For older children there’s hiking, zip-lining, whitewater rafting, silver jewelry-making, cooking classes and surfing. For younger ones there’s macaque-spotting at Sacred Monkey Forest, various theme parks and water parks, beach swimming, a trip to the butterfly house or bird park, or even gentle strolls through lush, green rice fields if you’re staying in Ubud. Bali is well served by taxis, making it relatively easy to get around. And its southern beaches are well developed enough to let you choose what type of holiday you want: surfing, lively, remote and quiet, or more exclusive. It’s easy to find food the kids will like if they’re not yet the culinary adventurer you are, and if none of the activities really engage them, there’s always splashing around in the hotel pool. For a family friendly tour with plenty of outdoor adventure, here’s a 10-day trip that combines culture, nature and pure fun. There’s a surfing lesson for the whole family, a day-trip to a local island for a beach barbecue, a ziplining expedition, a trek to a traditional village and lots and lots of temples and monkeys. Private transfers and a knowledgeable guide mean you don’t have to worry about finding a taxi or arranging a pick-up – you can just relax and focus on having fun with the family. Japan is a big place, and it really is easy to travel the entire country with children, but here we’re going to recommend a few of our favorite places. Tokyo is a good place to start. It’s busy and probably not the best city if you like to use a stroller (subways can get crowded and have a lot of stairs), but it also has a lot of kid-friendly features, such as museums (Ghibli Museum, for one), kids’ cafes, flat streets, great public transport, lots of parks, fun arcades and malls where you can rest and find family rooms if need be. Older children will be fascinated by the cultural differences and younger kids will no doubt find the activity and energy very stimulating. Then there’s Tokyo Disney Resort, which is has is own obvious attractions. Kyoto and Nara are also classic destinations that are easy to see with kids in tow. They’ll love exploring the ancient temples, shrines and castles, and get a kick out of feeding Nara’s famous tame deer. Both cities have wide open spaces where kids can run around a bit without annoying anyone, plus outdoor playgrounds where climbing and being silly are condoned. There’s also Arashiyama Monkey Park to feed the snow monkeys, though little ones should probably be closely supervised around these cheeky locals. Then there’s Kyoto Aquarium, which is a fun day out for all ages. 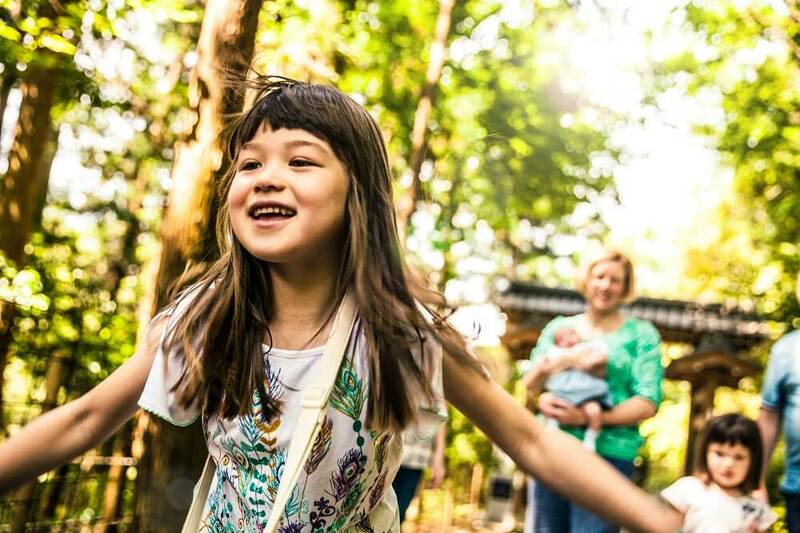 Traveling Japan as a family is so much fun, you won’t want your holiday to end. This is why our top Japan trip for families is 12 days long – there’s a lot to do and we don’t want you to miss out on any activities. This tour covers Tokyo, Kanazawa, Osaka, Miyajima, Hiroshima and Kyoto, with highlights that help you all get a deeper appreciation for local culture – in a fun way. You can opt for origami-folding lesson, a manga-drawing class, a samurai-sword fighting demonstration and even try your hand at making one of those life-like plastic food models you see in restaurant windows in Japan. With self-guided time as well as guided tours, this trip lets you mould a Japan trip to your family’s interests. We already mentioned China in the Hong Kong section above – its reputation for being difficult to travel is not completely unfounded, but if you plan carefully, it is one of the most captivating destinations in Asia. There’s millennia of history and culture, incredible architecture galore, spectacular scenery right across the country and delicious food – not to mention pandas. If your children are old enough to enjoy cycling, rock-climbing, kayaking and light trekking, Yangshuo, near Guilin, Guangxi will have them enthralled. Famous for its towering karst cliffs and watercolor mountain scenes, Yangshuo is a fairytale setting for an outdoor adventure-seeking family holiday. With river rafting through lush fields, ethnic villages where you can learn local customs, terraced rice fields and bicycle tracks you can take a leisurely ride along, it’s a blissfully serene place far from the hustle of China’s major cities. And the scenery is truly magical – as you would expect from a locale that has inspired artists for thousands of years. This 7-day trip to Yangshuo combines a variety of outdoor activities with culturally immersive experiences. You’ll meet a local families in the Red Yao village of Huangluo Yao and visit the 600-year-old village of the Zhuang minority. You’ll take a four-hour trek along the ‘Dragon’s Backbone’ between terraced rice fields more than 700 years old. You’ll go cycling through villages, take a cooking class, go rock climbing and much more, all in one of the most iconic mountain landscapes in the world. If the happiest place on Earth is Disneyland, then Bhutan must be second place, because we think it’s got everything a family-friendly destination could want. You probably aren’t taking your newborn here if you want to get out and enjoy Bhutan’s pristine outdoors, but children old enough to enjoy light trekking and curious enough to be excited by temple trips will find it as magical a kingdom as any. Bhutan is such a singular destination that your children are unlikely to experience any place like it. Locals wearing traditional dress, intriguing indigenous animals like the takin, preserved mountain fortresses, the gargantuan, snowcapped Himalayas, the prevalence of Buddhism in prayer flags everywhere you turn – it’s a beautiful and peaceful place to bond as you explore as a family. For families that enjoy trekking, we recommend a tour like this 8-day adventure. Starting in Thimphu with some city sightseeing and a warm-up trek, this tour features a low-intensity trek to a remote monastery, deluxe tented accommodation in the mountains, a chat with Buddhist monks keen to impart wisdom, a hike to the famous ‘Tiger’s Nest’ monastery on the cliffs of Paro and much more. Your private guide sets a leisurely pace for trekking, with plenty of refreshment breaks and stops so you can truly enjoy the journey. If you’re inspired to travel to Asia with children, get in contact with one of our Travel Specialists, who can customize a bespoke trip for you, minimizing transfer times and boring bits and maximizing fun. If you’ve got any suggestions for best Asia destinations with kids, we’d love to hear them too! Send us an email or leave a comment below.